So what next? Let's absorb more pagans to the north. I also had to put down a couple of revolts, and I created a duchy. That costs money, but it prevents my vassals from getting there first. I would create more duchies, but I like to save my money for a mercenary emergency (if I need to hire mercenaries to win a war). But then I get a chance to hold a grand tournament, so I blow 200 gold on that. 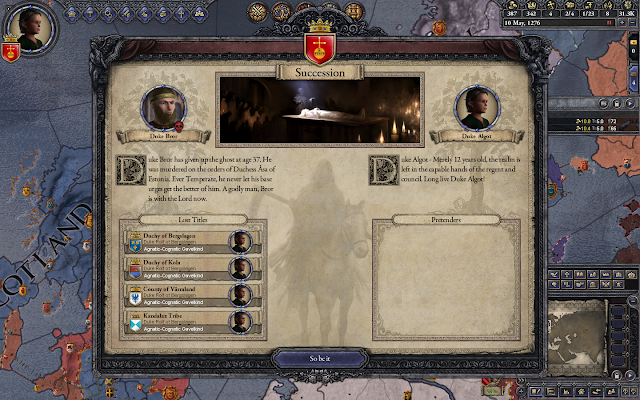 Unfortunately, tournaments are dangerous and I lose one of my sons (the spymaster). Prince Inge now has three kids, but his wife died in childbirth with the third. A month later, he has a new wife, so I can't set up a new marriage for him. 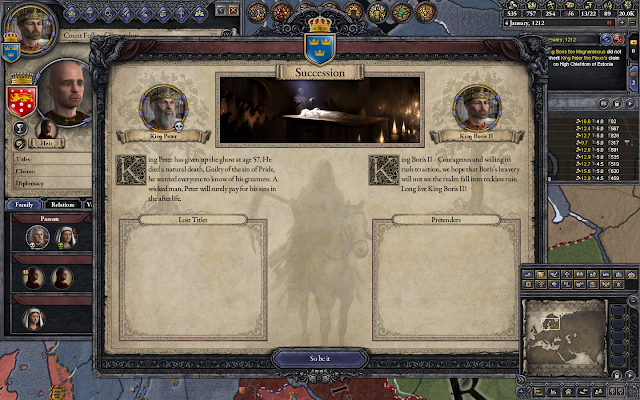 For some reason, the King of Denmark has been trying to kill my wife the whole game, so she's in hiding. 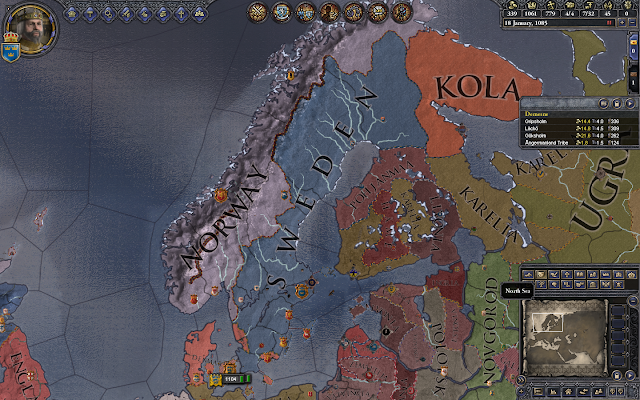 I tried to extend my holy war into Finland, but the infidels ganged up on me. I knew I needed my mercenary piggy bank for a reason. No more wars until I save up 500 gold. 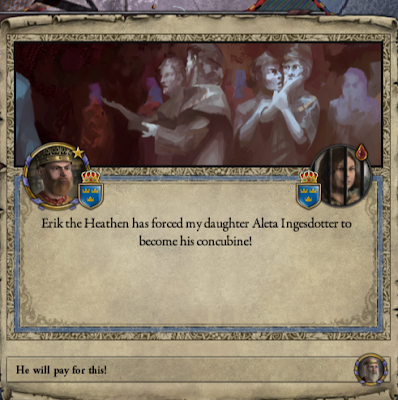 While I am saving up, I notice my brother-in-law and vassal, Prince Erik, has gobbled up part of Denmark. I am tempted to finish the job, but I would really like to attack the heathens. Apparently I can hire holy orders, which may be cheaper, but I am going to still wait until I hit 500 gold. OK, I did it. I probably ended up hiring more mercenaries than I needed, but I still expanded Sweden. That looks nice.